Retail Party Supply Store, Oak Creek, Milwaukee Wisconsin - Fun Events Inc.
Party Supplies, Decorations, Novelties, Helium Balloon Services, and more! 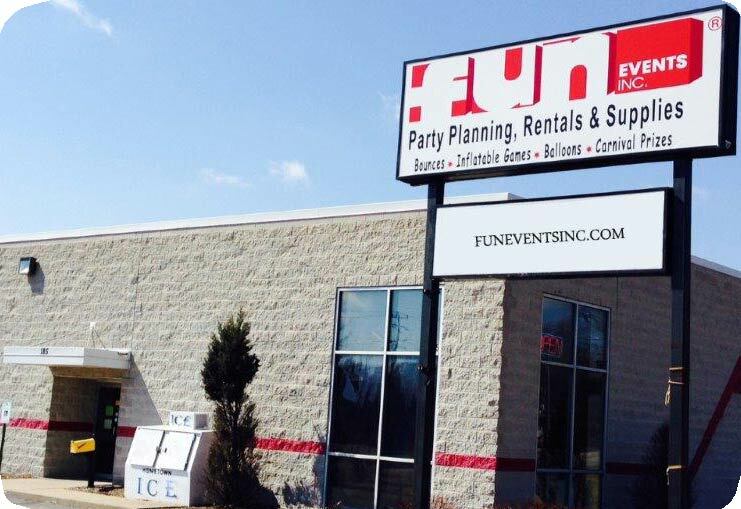 Fun Events is a family owned local business located south of the Milwaukee Airport. Visit our retail party store to find your upcoming party supply, novelty or balloon needs or shop online today. Interested in some of our fun party rentals, inflatables, bounce houses, dunk tanks, games, concessions, tents, tables or chairs? Many of our popular party rental items can be picked up at Fun Events including prizes, novelties, party supplies, and our fun party rentals. No matter how big or small, Fun Events can handle your next party. We have a fun assortment of party supplies, decorations, rentals, and more. Click Request Info or contact us for more information. Call 1-800-242-5655 for more information. Clicking this link will redirect you to the Fun Events, Inc. retail party supplies and prizes, online shopping page.